Photography has become a more convenient hobby among many people today, now that digital cameras and smartphone cameras are becoming better than ever. Not only that, mobile photography also has become a popular online pastime. People only need to whip up their smartphones, take a picture and then share it with friends over a social network, in the hopes of stimulating discussions and comments. But over time, some people may eventually get tired of seeing the same pictures that others are taking- plates of food, selfies, pets and others. Some people may need some bit of inspiration for some creative image captures. This is where the new OKDOTHIS iOS App may come in handy. OKDOTHIS iOS App is unique in the sense that it does not just provide the same features that other similar mobile photography-related apps provide. Users of the app have these Do’s that they wish to follow when taking pictures. There are Do’s as simple as snap a photo of object behind you or as introspective as taking pictures of object that represents your life right now. You may either end up taking a boring picture or something that gets your imagination going. What makes the OKDOTHIS iOS App interesting is that it gives users some bit of inspiration on what pictures to take using their device. They no longer just have to be limited to taking pictures of the same things over and over again. 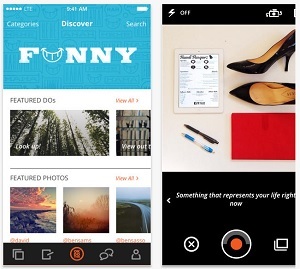 Users can also instantly share their unique pictures to friends online or they can prefer not to. The app also provides information on some Do’s as to how many people in your network may have already done it. That way, you can try to accomplish those Do’s that the others may not have achieved yet. That will really make your adventure in mobile photography even more interesting. The OKDOTHIS iOS App is available at the Apple App Store for a $ 2 download.